Bringing a new level of versatility and capability to flash photography, the Speedlite 430EX II features a powerful flash (guide number of 141 ft./43m at ISO 100) with a fast recycling time in a compact, durable body. A one-touch quick-lock mechanism makes it easy to attach or detach the 430EX II from the camera and a metal foot has been added for strength and durability. Flash controls can now be set through the camera's LCD screen on compatible EOS Digital SLR cameras. 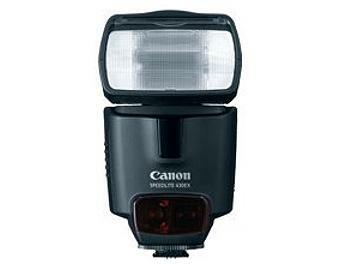 The Speedlite 430EX II is also quieter, recycle time is 20 percent faster (as compared to the 430EX) and since it is compatible with Canon's wireless E-TTL, it can be used as an affordable "slave unit." Number of Flashes : Approx. 200 to 1,400, with AA-size Alkaline Batteries manufactured within the last three months or AA-size Ni-MH fully charged batteries.